Show off your love for a "galaxy far, far away" with this officially licensed Star Wars travel mug! 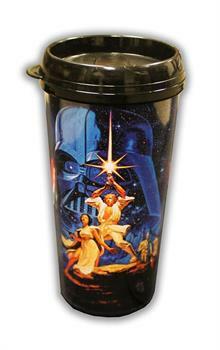 The plastic mug with lid holds approximately 16 ounces and features classic poster art for 1977's Star War: A New Hope! Sure to make a great gift for your favorite Star Wars fan! Not dishwasher or microwave safe. Hand wash only.